Also, Mr. C, Conrad has his own benefit print. After making 16 vet visits in 4 weeks, the always smiling Conrad got his own 7″ x 5″ print, a super deal at only $10 to help offset the cost of his bandage changes. 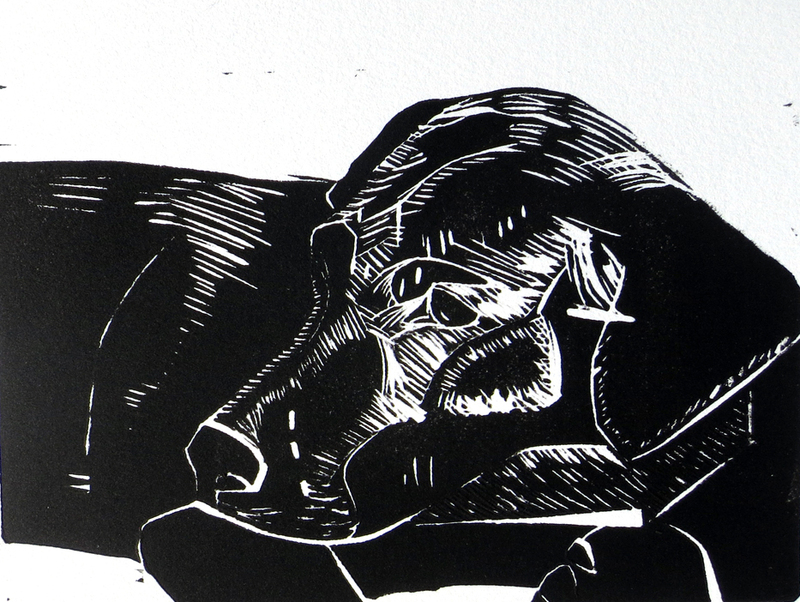 Surprise a friend and make them smile with a smiling Labrador in a cone hand printed linocut. All details are on my Etsy Stonetrigger Press Page. My four month Governors Island residency is coming to a close. As part of my participation in Lower Manhattan Cultural Council’s Process Space artist residency program, I’m pleased to invite you to learn more about my latest project “Migration” a series of linocut printed and hand colored birds at LMCC’s Governors Island Open Studios. This is a preview for a later and 10x larger more sophisticated installation at Brooklyn Bridge Park, in October. Open Studio is free and open to all on June 25th from 1 to 4pm only. Click here for FB invite. 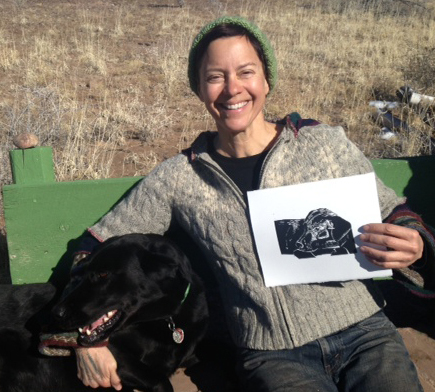 Lastly I will leave for my studio in Abiquiu, New Mexico on June 29th and stay until July 29th. From there I will drive to Cape Cod, Massachusetts for a three week artist residency at the C-Scape Beach Shack on the National Seashore. and return to NYC on September 1. 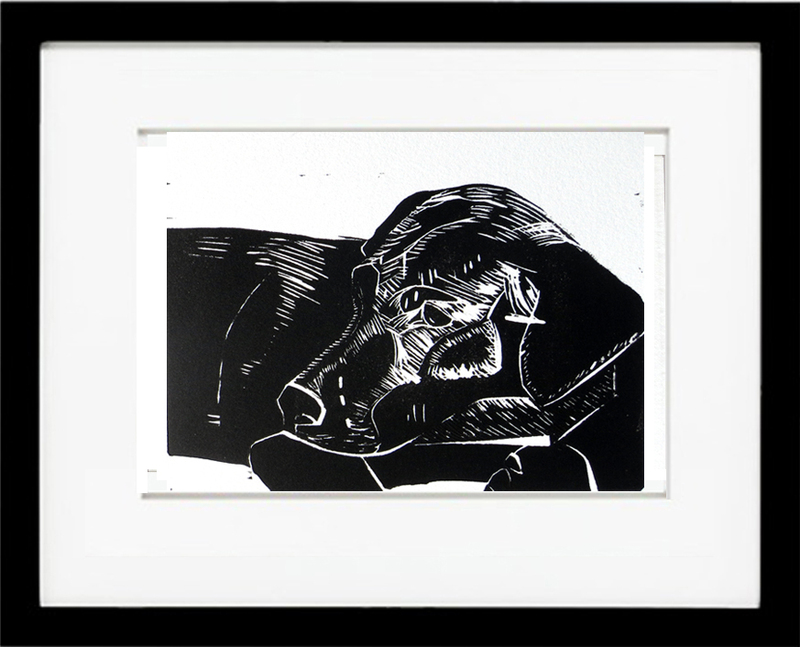 Conrad, linoleum block print, now on Etsy. This is Conrad, one of my two Labradors. He was a rescue as a puppy from North Shore Animal Shelter, NY. Yesterday we had a rough day, Conrad, Homer and I ran into a pack of feral dogs while out on our walk. Conrad got a bit on his hind quarters. We spent all morning in the vets office getting him fixed up. Homer was so sad, he just stood stunned and crying after I got the dogs to run away. I have never seen anything like it. But if you know labs, they are happy within seconds of just about anything! This print is for Conrad, my rough and tumble, used to be afraid of everything dog, now friendly as can be and totally happy-go-lucky, even with big tooth holes in his leg. Conrad is a very special dog. He even likes his print. This is print 25 of 30 in a project of 30 prints in 30 days. Each image is 4″ x 6″ printed onto Rives BFK paper. They are printed in an edition of 10 and always only $20 and available on Etsy.